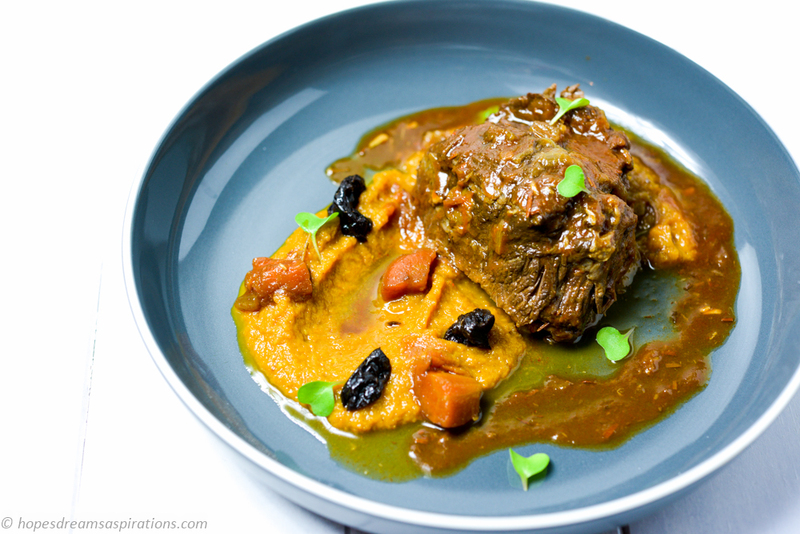 Beef cheeks is gaining in popularity, having seen quite a few recipes using cheeks and gracing more restaurant menus. This recipe here is one that I’ve developed over the years and I make it with different cuts of meat on a monthly basis: cheeks, tongue or crosscut. My local butcher has the freshest of them and I stock up when I see them. This is a cheap cut and with some tender loving care (i.e. slow or pressure cooked) it produces the most amazingly tender and texturally different meat. I have anchovies in my recipe for the added depth in flavour. Carrots are favoured to meet the cost but you could substitute with pumpkin or potatoes. The beauty of this dish is that it keeps on giving. Beyond dinner. Any remnants and sauce can be scooped up for next day’s pasta. Or tipped into a pastry lined dish and baked as a pie. Or mixed with boiled baby potatoes for a quick salad. Oh and if desperate, mix it with left over rice, a sprinkling of paprika and chopped coriander for a quick Mexican-style lunch. I often make double batches and save the beef to use in any of the above dishes. You can also make a quick curry by cooking spices and adding beef and coconut milk, it doesn’t take much time at all as the meat is already tender. Super delicious and clean plates afterwards, always. It has saved me so much time in cooking for the week and I can spend more time doing things with my family.